Now we have a few sub-assemblies prepared & we have an assembled bottom end including the gearbox in place; clutch mounted & gear drive conversion trial fitted. Let’s get the bottom end fully built & move up to the top end. piston stopI usually dry fit the barrel & ringless piston at this point to allow a piston stop to be fitted. This gives us something to tighten the crank nuts against. The stop is, as you can see, made up out of scrap & is held down by the barrel studs. 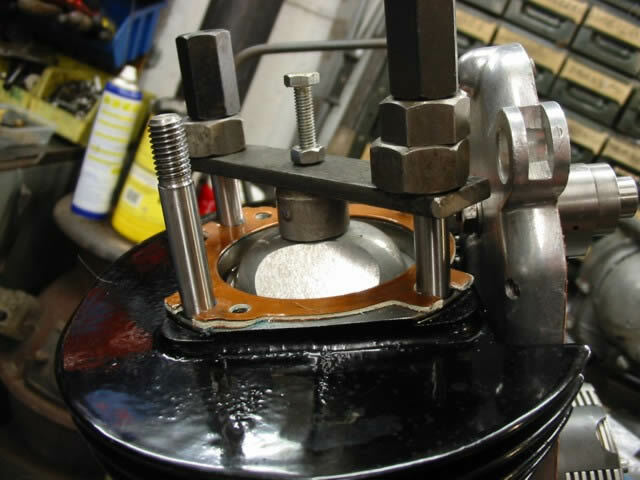 Use a pad under the central bolt & stop the piston about 50deg BTDC. In this pic the head gasket is in place but at this point it’s only on there to check out its fit. Earlier we trial fitted the crank pinions to check out primary drive alignment & ensure the cam, intermediate gears & oil pump/points gear rotated freely & could be timed up. Now we can fix it all up permanently. Fit the first crank gear its key, lockwasher & nut with a drop of Loctite on the thread & lock it up. 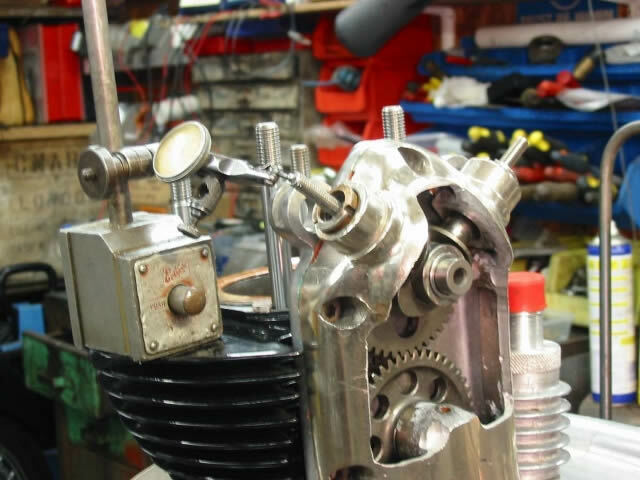 Time the oil pump/points gear to the crank gear and secure it with a split pin. Slide on the “double gear” (gear /sprocket combo if you are on chain drive). Fit the second crank gear & mesh with the clutch. I use a Belleville washer behind the nut and a drop of Loctite to retain it. The cam & intermediate gear can be put in place now & timed up. The OE gears are marked up but its always good to check the timing with a degree disc & make sure all is well. I have a cutaway dummy outer cover which was given to me years ago by PJ in the USA. A very handy bit of kit which allows timing to be checked without fitting the full cover. Thanks PJ! In case anyone thinks a good cover was sacrificed to make this it was scrapped by the original owner who had it chrome plated! No doubt his engine didn’t appreciate the acids used eating away the cast-in steel oil feed tube to the crank, cam, its drive & rocker gear. I drop a couple of allen head screws in the followers which make extensions to measure the start of lift from. 6mm cap heads seem to be made for the job. Timing will depend on your cam profile and most Parilla cams have figures available & easily found on the net or in other published material so I won’t list them all here. Once you are happy the cam is dialled in you can fit the outer timing cover. Before we fit it lets have a look at an aspect which I think benefit from some improvement – loss of oil pressure to the cam & top end. 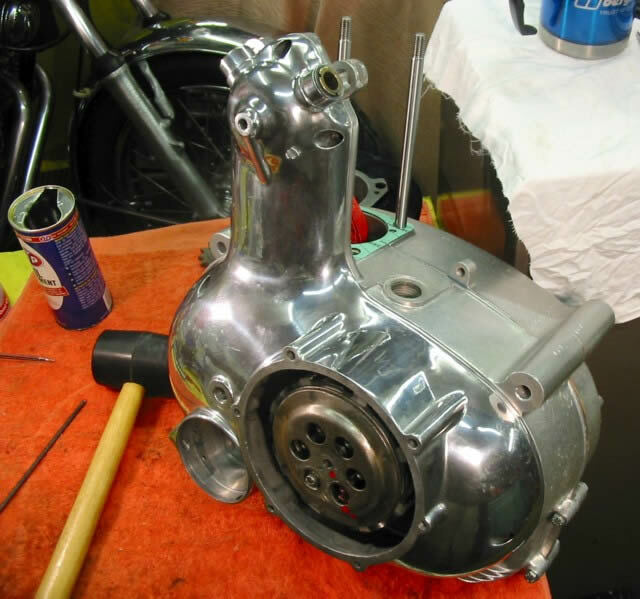 In Vincent HRD V-twin engines oil is fed to the (plain bushed) cam follower spindles via an oilway in the timing cover & through a hollow spindle – same idea as a Moto Parilla 175/250. 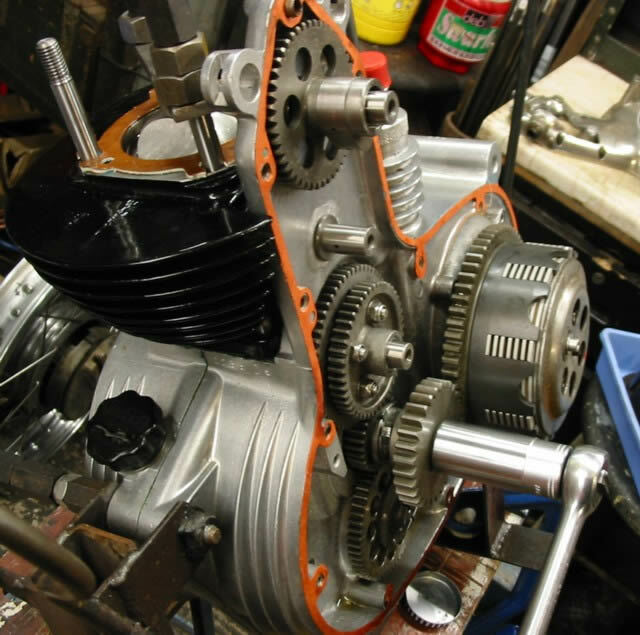 The Vincent outer cover has restrictor plates fitted to limit the supply to the followers. The Parilla outer cover does not – it just has a roughly 2mm diameter hole. The engines I build mostly have needle roller bearings running on their cam drive spindles so why do they need massive amounts of oil? I fit brass shim discs pierced with 1mm hole to meter oil to the lower “double gear” spindle & the intermediate gear spindle. They are fitted behind the “top hat” bushes which support the gear spindles in the outer cover. A light smear of jointing compound secures & seals them to the outer case. 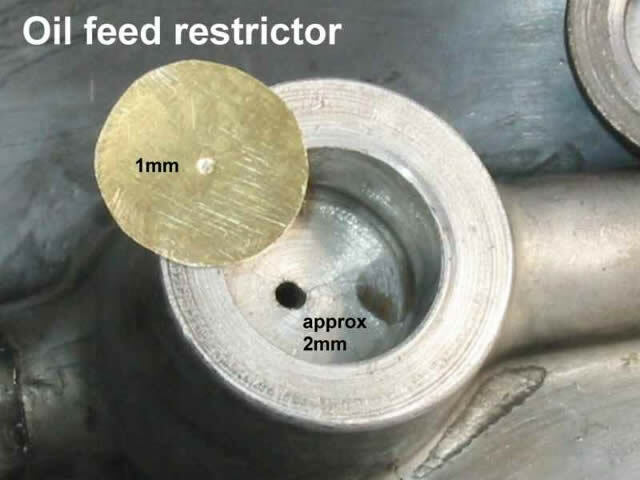 Obviously the bushes need to be removed from the cover to do this and allowance made for the thickness of shim stock used to create the restrictor plate when refitting the bush – the inner end of the bush may require a few thou turning off it to let the bush seat properly and ensure it doesn’t bind on the timing gear when the cover is refitted. I have noticed an improvement in oil delivery to the top-end since doing this mod & no trouble with lubrication of the gears or their spindles. 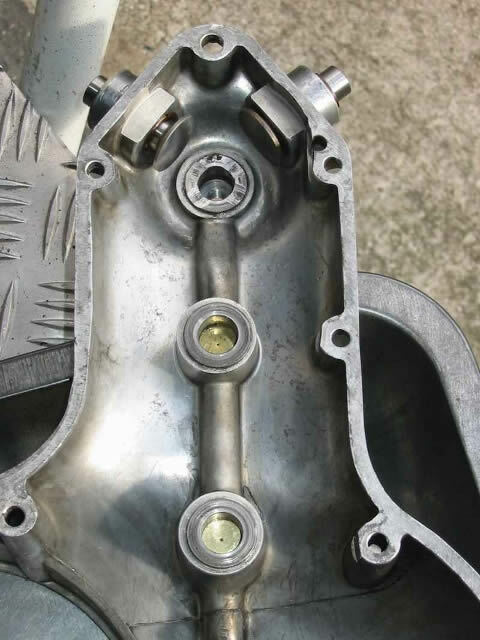 Before offering up the outer timing cover to the engine you must fit the cam followers of course & also the drive spindle for the points which locates in only one position into the oil pump drive gear. 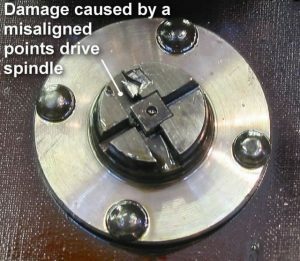 It is possible to misalign the spindle if you are determined enough. My Wildcat 250 engine contained an oil pump gear damaged in this fashion. The ham-fisted mechanic seems to have had two attempts at alignment & succeeded in creating the damage shown in the picture. 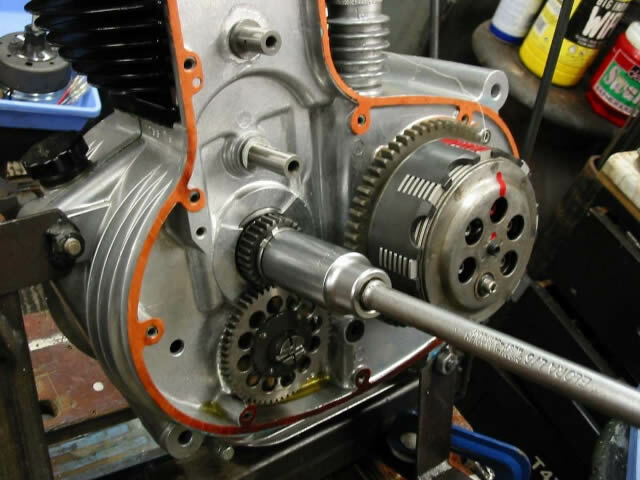 When offering up the cover it’s essential to get it aligned with the cam & intermediate gear spindles; align the points drive with the oil pump gear; ensure the cam followers don’t drop in and finally…not forget to pop in the most important oil seal in the engine before closing the cover. That’s the “D” ring which seals the oil pump outlet to the outer cover joint. See ” the Main Oil Seal” page for further information. You may need to tap the cover on lightly with a soft mallet to get it to seat fully.